Alright, think back for a second. What was the last great World Series that you remember? The Red Sox winning it all in 2004 and thus breaking "the curse." Right? The ALCS against the Yankees was absolutely legendary but the Sox made a quick 4 game sweep against the Cardinals to win the World Series. After the drama of overcoming a 3-0 series deficit to New York, the World Series was merely an afterthought. In fact for quite a while now, the World Series has been a bit of a snoozer. Three of the last five have been four game sweeps and the other two only went one more game is all. Hell with all the bizarre rain delays and such, I can't honestly recall if they actually finished last year's series or not. 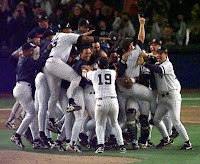 Face it, the last decent World Series was 2003 when the Marlins upset the New York Yankees in 6 games. But Chip, if a series can go six or seven games isn't it a moot point whether or not the Yankees are involved? To some extent yes, but looking back what World Series do you recall more, 2002 when the Angels beat the Giants, or 2001 when the D-Backs beat the Yankees? Both went the full seven games but the hype and the aura surrounding the Yankees made it that much more dramatic. I hate the argument that the big market teams need to be in World Series otherwise no one will care, but sadly there is some truth to that. Yankees vs. Dodgers is going to have much more intrigue than say Twins vs. Rockies. So here's to the Yankees making the World Series. I don't even care which NL team they play. The Dodgers would be awesome because of Joe Torre and Manny. The Cardinals have the pitching fire power and Albert Pujols to make some historic moments. The Phillies are the defending champions. And who wouldn't want to see Yankees vs. Rockies? New Yankee Stadium plus Coors Field? Every game could wind up with double digit scores. If you want a series that folks will talk about for years to come, we need the Yankees.